IMPORTANT: The configurations, that is, the code sections underneath are not wrapped. However, if you want to copy paste them, you can just select them and despite they being not visible to you, they’ll get copied into the clipboard. Otherwise you may want to refer to the PDF version. Asterisk is an open source PBX. Which means, you can setup your own little telephone exchange in your home/office environment. On a much larger usage, you may look forward to setting up a redundant phone setup wherein multiple boxes are interconnected with each other and provide some sort of failover capability and easier management, which is possible through something called DUNDi. This document aims to provide such a solution with a possibility of horizontal scaling instead of vertical scaling. So, this may mean that by using low-end commodity hardware, you can setup a strong telephone infrastructure which can cater to thousands of users. Read the document carefully. Read it fully before you start implementing it. It is intentionally detailed so that you know what you’re doing. All credit of this document goes to JR Richardson. I’m afraid I’ve not been able to find a suitable link for him, but his whitepapers and presentations are the ones which helped me move forward. And of course, Mark Spencer – the guy behind Asterisk. Without him this document wouldn’t have existed. Though I have significant experience doing Linux and related systems, but I’m more of a novice in Asterisk. The following may or may not work for you. I don’t provide any warranty whatsoever of it being successful, or rather, consistently successful, and providing an actual load balanced solution. I’ve yet to implement it in a production setup, and hence all you do is at your own risk. The below procedure SHOULD work, but I CANNOT say that it WILL work. Asterisk : http://asterisk.org It is a PBX (Private Branch Exchange) software which runs on Linux platform. It allows you to have VOIP facility without incurring cost on proprietary hardware, and can run off a home desktop system. DUNDi : http://dundi.com DUNDi is a peer-to-peer system for locating Internet gateways to telephony services. Unlike traditional centralized services (such as the remarkably simple and concise ENUM standard), DUNDi is fully-distributed with no centralized authority whatsoever. We will be using it to interconnect multiple asterisk boxes and setting up a load balanced environment which will also act as a failover. RealTime : http://www.voip-info.org/wiki/view/Asterisk+RealTime It will allow us to connect to MySQL and have the users registered in there instead of being hard coded in sip configuration. This way it will be possible to have users register to any registration server and not just one on which they’re configured. You need to have some experience related to Linux systems. You should be comfortable in compiling applications from scratch. The method mentioned in this email should work as is, but if there are issues, then you would be resolving them on your own. Also, it is highly recommended to have some working knowledge about Asterisk. You should have setup some Asterisk based environment – if you’ve not done that yet, then I think you should first concentrate on that. You’ll be delighted to see what all is possible through Asterisk. You need to have atleast TWO working Debian/Ubuntu machine. I will be using THREE machines eventually, but will start with two. Though the following would work for any Linux distribution available, the steps related to installation and initialization of packages could vary – so you may refer to the documentation of your distribution. That’s all. Asterisk is configured. You may run the following to verify. For each file listed below, certain changes are done. You can name as per your convenience, but it should match in all the relevant sections further in the document. What we see above is that there are two servers, Server A and Server B. Server A has SIP user 1001, and Server B has 1002. Both the users belong to a context called “internal”, which probably means that when they dial in any extension, the first context that they’ll hit is “internal”, and from there onwards they’d be redirected to other contexts as per the dial plan. The context “internal” is defined in “extensions.conf” file. There’s not much in that context except one single extension, 123 in Server A and 456 in Server B. When that extension is called, a congratulations message is played. So to test it, I have used an application called Zoiper which allows two lines to be connected. 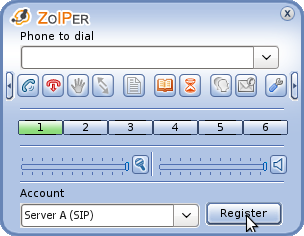 You can download Zoiper from http://www.zoiper.com/softphone/ – I used Zoiper Classic for Linux. I created two SIP accounts in Zoiper, for Server A I entered 192.168.1.5 as domain, and 1001 as username, and for Server B I entered 192.168.1.6 as domain and 1002 as username. Rest of the details can be added as per your preference. I deselected the “Register on startup” option under advanced settings. Then on the Zoiper interface I registered to both the servers. Now select in Zoiper, the Server A Account and dial 123 – it should playback the congratulations message. If you try to dial 456, it’ll not work. But if you select Server B in the Account, and then dial 456, it should work as expected. So, our basic configuration is working fine. If you add more SIP users in sip.conf file, and add relevant extensions in extensions.conf file, then you can have a single server PBX running perfectly fine. It is important to have the above working so that we can be sure that our setup is ready for DUNDi. Before we delve further into DUNDi, please remember that the most important thing here is “contexts”. If you specify them incorrectly, it wouldn’t work as expected and you’ll be left wondering what’s happening. Let’s begin now in a two server configuration. The purpose here is that extension 1001 would be registered on Server A, and 1002 on Server B. But, via DUNDi, Server A would know that extension 1002 is on Server B, and would effectively be able to call it too. The regcontext parameter is very important here. It auto-creates a context as soon as a SIP user logs in (in our case the context will be dundiextens). This is used and searched by DUNDi to get to the desired extension. Later we’ll see how to view the users who belong to “dundiextens” context. Similar to Server A, the new context has to be added. The following would be the final sip.conf for Server B. We will be using IAX2 trunk to interconnect the DUNDi boxes. IAX2 doesn’t work too well in virtual machines as it requires a timing device/timing source. For me it didn’t work well as far as Playback() was concerned, but when doing a voice call everything seemed to be just fine. I’ve not been able to figure out if it’s a timing device/virtual machine issue or it’s just some setting in iax.conf that needs to be done. If I run dahdi_test in a virtual machine, the results are always above 99.6%. The same is with a dedicated machine, so I guess the timing source seems to okay. Tried using SIP Trunk also, but it causes a number of issues when doing RealTime. When using RealTime the users were registered multiple times on Asterisk box, so 1001 which was initially registered on Server A got registered on Server B as well. Also, I wasn’t able to figure out a way to send a call from Server A to a particular context on Server B. It also caused a bit of scalability issues as well since if using dedicated trunks then I’d have to provide each server’s details in sip.conf of all servers. So when a new server is added, the sip.conf would need to be updated on all the servers, which isn’t that elegant (because then sip reload would also be called). So, as we see, there are three contexts we’ve encountered till now. Context “internal”, which is associated with the SIP user being registered, context “dundiextens” which is auto-created as soon as the first user registers on a particular server, and lastly context “incomingdundi” – this is used when a call arrives via the IAX trunk. All these have to be mentioned in extensions.conf of each server. If you notice, there’s a parameter “dbsecret” in the file. I guess it allows one server to authenticate to another by using a username/password combination. The advantage is that it’s just a username/password authentication and not any server information hard coded. Which has the best advantage that if any new server is added to the cluster, it’ll automatically be authenticated. Also, I had read somewhere, probably in the links below, that “dundi/secret” value for “dbsecret” is to be taken literally – you shouldn’t be changing it. Before we proceed further, we will need to create a couple of keys on one server, and COPY it to another server. I haven’t tried creating different keys, so cannot confirm otherwise. and when it asks for pressing ENTER, just do that. A couple of files would be created in that directory – dundi.key & dundi.pub. Copy both the files to Server B in the same directory – /var/lib/asterisk/keys. This essentially means that dundi.key and dundi.pub are identical on both the servers, and would remain identical as new servers join the cluster. entityid=00:16:36:99:54:62 <- The MAC address of the interface for 192.168.1.5. However, it could be any mac address that you own, that is, it should be something unique. cachetime=5 <- Better to have it at 5 seconds than 3600 seconds if it’s a closed group network. If there’s a failure of one server, the re-requests shall be redirected to other servers after 5 seconds have elapsed. May not be good if you’re connecting to outside servers not in your domain as it has to potential for frequent queries if there’s heavy traffic. ttl=2 <- The number of DUNDi lookup requests made. So, if request goes to Server B from Server A, then that’s one request. Now Server B can make a maximum of 1 more request to other servers it has paired with. As per the documentation, here “priv” is the DUNDi context and will be used by DUNDi. We’ll see later how it’s used in extensions.conf file. Then comes the local context which it’ll search. In our case it’s “dundiextens” which we defined in sip.conf under the regcontext parameter. Then is the weight, the technology being used, the destination that is to be sent to the server requesting information, and then further options. You can review DUNDi documentation at http://www.voip-info.org/wiki/view/DUNDi for more details on each of the parameters. Part 3 – These are the peers that you’ll register with for looking up / doing DUNDi searching. So, if you have multiple servers, then you’ll need to have multiple peer definitions similar to the one mentioned earlier. Since we’re using only one Server (Server B) as the peer, we’ve entered that information in dundi.conf. I think the MAC addresses are more for consistency than any technical verification, so you should be able to connect machines outside your network too – across the globe maybe. Our DUNDi configuration is complete. Now Server A has Server B as DUNDi peer, and vice versa. This means if Server A queries Server B, then Server B would respond favorably and provide the location to the SIP extension if it exists on that server (and of course vice versa). We’ve created a new context called [lookupdundi]. This performs the actual lookup, and if you notice, it does search the “priv” context mentioned in dundi.conf file. The [internal] context still has the extension 123 on which demo-congrats is being played. However, we have included “lookupdundi” context in there, and further to that created a pattern of 4 digits starting from Priority 2. Priority 2 is very important here. Why? Because when a SIP Phone is registered, due to the regcontext being specified in sip.conf, a Priority 1 with NoOp is already created, which you can see by typing “dialplan show dundiextens” on the asterisk prompt after the SIP phone is registered. So, when the phone will reach the “internal” context, it’ll look for Priority 2, and that’s what we need to provide. The last context, [incomingdundi] is called via the IAX Trunk that we created (called “iaxuser” in sip.conf). This transfers the request to “internal” context on Priority 2. So, it signifies that, primarily the “internal” context is the one where in the primary dialplan would be written related to what will happen to a call once it arrives. At this stage, we are not doing anything except playing a congratulations message. There’s not much change for Server B, except having a different extension 456 instead of 123. So here we are, our DUNDi configuration with two servers is complete, and I just hope it works without issues for you. Here is how we’ll test it. Use Zoiper and register to both Server A and Server B. You should see appropriate registration messages in the asterisk console of both the servers. Now we will see if on both servers the “dundiextens” has been created and if the users 1001 and 1002 are part of it. All cool. Both our phones are registered and as you see the first priority of NoOp is created in there. Next is to see if the peers are displayed correctly. Server A would show Server B as its peer, and vice versa. Next we will see if what happens if a lookup request is made by DUNDi from Server A to find 1001 (which is on Server A), and 1002 (which is on Server B). As you will see, Server A will not give a result of the extensions registered on its own instance, but only those which are registered on other servers. So, 1001 when searched doesn’t retrieve any info, but 1002 does. DUNDi lookup returned no results. Doing the above on Server B gives the results as expected. 1002 returns no results as it is on the same machine, but 1001 does. Now let’s place a call from Server A selected in Zoiper to 1001. It shouldn’t play anything. Then place a call to 1002 – it should play a congratulations message, and there should be some information displayed on Server B’s asterisk console. We’ll now add Server C to our existing cluster. This will be our DUNDi lookup server and no user would register to it. There would be only one peer entered in all registration servers. So if a new registration server is added to the cluster, the other registration servers needn’t have the DUNDi entry in them. It will be easier to manage since the new registration server would be added into the DUNDi configuration of Server C only, and all other servers would know of it instantly. Let’s move to the configuration part on each server. I am assuming that you’ve done the basic installation of Asterisk on Server C. There’s no need for setting up sip.conf, iax.conf or extensions.conf on Server C, only “dundi.conf” is needed. Only the Peer’s MAC Address and host are changed in Part 3 of the configuration. So we have added Server C as a peer having IP Address of 192.168.1.10. The configuration is almost similar to Server A except of course the bindaddress and entityid. Remember, you should have copied dundi.key and dundi.pub from either Server A or Server B to Server C’s /var/lib/asterisk/keys. The two said files should be identical on all the machines. The DUNDi configuration will have information on the peers to which it will connect. Since it will connect to all asterisk registration servers, hence the peers would be Server A and Server B. A few details on above. The “ttl” is 1 instead of 2. Since our lookup server (Server C) is peering with all the registration servers, it should ask them only once and the registration servers shouldn’t forward the request to other servers. ttl=1 ensures that. If it had been ttl=2, then registration servers (Server A & B would query their peers – and their peer is only 1, Server C – and thus it would get into an unwanted loop. There’s an empty “priv => ” parameter. It is there because [mapping] somehow requires atleast one parameter, even if it’s empty. Peer 1 and Peer 2 are added. If you add another server to it, then you just need to add an entry in this file only and make it Peer 3 and so on. That’s all to it. Let’s test this out. In our test we have two servers, Server A and Server B on which the SIP phones would register. Server C would act just as a lookup server and answer requests. Start Asterisk on all the three servers and connect to their consoles. Now use the command “dundi show peers”. It should show only 1 peer on Server A & B, and 2 peers on Server C. This is just fine. Register your SIP Phone on Server A & B, so both extensions 1001 & 1002 should be registered. Now you can either do “dundi lookup 1001@priv” or “dundi lookup 1002@priv” from Server C and it’ll show you both. Doing “1002@priv” from Server A or “1001@priv” from Server B would also give you results which are retrieved from the peer (Server C). Make a call now from Server A selected in Zoiper to extension 1002 (on Server B). If you’ve been able to do a 2 server setup, this type of setup should be trivial for you. Remember, dundi.key and dundi.pub should be identical on all three servers, so make sure you do that. Yeah, having users hard coded in sip.conf file is so so so uncool! Let’s have them in database. Of course, for this to work you should have asterisk-addons installed on Server A and Server B. Server C is just the lookup server, so we don’t need anything there as far as asterisk is concerned. For our setup, we will install it on Server C as it is sitting idle in any case, doing just the lookups. You can have a dedicated machine for it depending on your requirements. Also, as JR Richardson had mentioned in one of the documents, asterisk realtime does a lot of database activity, so it is rather good to have it on other server and it should go via a separate network interface which is not being used for VOIP. Since usually all servers have atleast two ethernet cards, it should be trivial. Think about it and implement as per your requirements. I separated the user so that if in future I need to identify which user is doing what, then it’s possible. Otherwise you can have a single user, it’s much more convenient that way, specially when you add more servers. You can also use ‘%’ (quotes intended) instead of IP Address so that anyone can connect to it. Next import the database structure in which you’ll store the users. You can copy paste the following directly into mysql prompt, or save it as a file and import it later. This is copied directly from asterisk source and is in the contrib/scripts/sip-friends.sql file. A minor change you’d need is that “fullcontact” column should have a varchar(128), otherwise asterisk would complain. Last step – add two users into it, which will be our SIP users. Let’s move on to other configurations. Now we’ll remove the users in sip.conf files on both the servers (1001 & 1002). You may want to comment them out by prefixing a semi-conon (;). We’ll just remove the sip user entries (of 1001 & 1002) in sip.conf file as it’s no longer needed. And we’ll add one parameter “rtcachefriends” in the general context so that users registered in real time are cached by sip and thus qualify=yes works for them. You may omit it as per your requirements. Unregister the phones from Zoiper. Restart asterisk and then open the consoles of Server A & Server B. On Server C’s mysql prompt, if you enter “show processlist”, you will two persistent connections from both the servers. All’s good to go. Let’s try calling extension 1001 now from Server B selected in Zoiper. It should playback the congratulations message that we’d defined in extensions.conf. Till now we had just used playback. If you intend to actually call out the users, which of course you’d want to do, then do the following. If you notice, I’ve included “dundiextens” in the “internal” context. This would allow you to call users who are registered on the same server as yours. If they’re not registered, then “lookupdundi” would be called. The SIP extension if found would ring for 10 seconds unless answered, and then hangup would be called. This is very very basic, but it should give you an idea where to start. If you plan to use extensions also in RealTime instead of hard coding them, such as for IVR, Voicemail etc. Then the following should work. I would prefer that you don’t put the user extension information in there, but rather use it as a replacement for extension 456 or extension 123 that we created above. Restart asterisk and then try dialing out extension 100 from either Server A or B. One thing to note is that we are restarting only because we’ve made significant changes in the configuration. The best part of RealTime is that you don’t need to restart any of the services if new SIP users are added, or new extensions are added. Secure the SIP users. In the database, put some value for “secret” column. DNS SRV for load balancing as well as failover. Zoiper supports DNS SRV and it’s not that difficult to implement. All you need is a few SRV records in your DNS Server, and that’s pretty easy via GoDaddy’s DNS. You can assign weight to each server as well as port numbers, and the softphone would automatically connect to another server in case the one it’s connected with goes down. GeoDNS in case you are having users spread across the globe. Have multiple registration servers spread all over the world and use GeoDNS to make the user register to the ones closest to them. MySQL Cluster setup for database. So you’ll have high uptime. Master Slave/Replication configuration of MySQL for better performance. JR Richardson mentioned somewhere that we can have multiple MySQL servers running – the data is read from one database and written to another. This way we can have faster and localized reads in case the servers are geographically apart. Hope this serves a good purpose for you. Any comments or questions are welcome. Posted on July 3, 2010 by Vivek Kapoor. This entry was posted in Linux, Open Source, Technology and tagged asterisk, cluster, debian, dundi, iax, iax2, jr richardson, linux, load balancing, load sharing, mysql, pbx, realtime, sip, ubuntu, voip. Bookmark the permalink. ← Board800 now on Twitter! One item I’d like to mention, if you’re using this type of setup on public internet, then there could be chances that the connection your users are using is not stable. So this could lead to scenarios that a user registers on Server A, doesn’t unregister due to some network issue and then registers on Server B. So the entry would now exist on both servers A and B. Ideal solution would be to trigger an unregister event on all dundi servers for the extension except the server on which the user has actually registered. However, I was not able to find a possibility of implementing that. By default the maxexpiry (or maxexpirey in asterisk 1.4) is 3600 seconds, which is 1 hour. Which means if the user doesn’t unregister correctly, then in 3600 the user would be unregistered automatically/forcefully. However, that’s too long a delay. A 60 second delay works well. one of the most comprehensive tutorials i ever read! thank you very much! I tried to implement the setup but I am using TCP for Sip signaling instead of UDP.I am not able to make call between two extensions on different machines. @Ankur – I’m afraid I’d not be able to help much. It has been quite some time since I last worked on it. Are you using DUNDi, or you’re just trying to interconnect between two machines on a regular asterisk setup? @Vivek-Thanks got it working..I am using Dundi. Finally got the setup working on Amazon-EC2. Ankur would you please – help us how should do it .. i run 2 elastix server and configure sip.conf iax.conf extentions.conf and dundi.conf but when i dundi check with this command dundi lookup 1001@priv on both machin . elastix tell me DUNDi lookup returned no results. DUNDi lookup completed … whould you please tell how can i solve this problem ? Very comprehensive tutorial. I am new to Asterix and want to create a commercial installation. This was the best tutorial/walk through I could find online. Gave me an understanding of most of the basics of what I need to know. I question though. Can I build a web app to simplify adding new users? Yes, building a web app would be very easy. Since the users really reside in MySQL, you can build an interface through PHP or any other preferred language to add/modify the users. I tried to download the pdf version, but got a “http Server Error 500”. I just tried it out and seemed to work fine. You can alternatively take a printout of the blog as well if needed. Excelent! It is a complete tutorial with tips and useful hints! I wonder if there is any way to transferring an active call to another asterisk server.. I mean assume user connected to asterisk A and talking with another client on asterisk a or b. And when a fail occurs on asterisk a serverand service goes down..and load balancer transfer your connectionto asterisk b automatically. Is there a way to continue to this call or not?Im aware user doesnt need to re-register to new asterisk server but does the connectiondrops..
PS: Im not planning to make a p2p call due to need of recording all calls.